Married since 1983 to Carol, with 2 children Daughter Hallie and Son Nick. Jerry became involved with the Masonic Family in 1997 when Hallie became a Rainbow girl. In 2000 he became an Advisory board member for San Pablo Assembly #117,were he is now the Board President. Jerry was selected to be the California State Rainbow Dad in 2017. Jerry became a Mason in 2008. In 2009 he joined Order of the Eastern Star and has served in many offices. In 2010 he became a York Rite Mason. 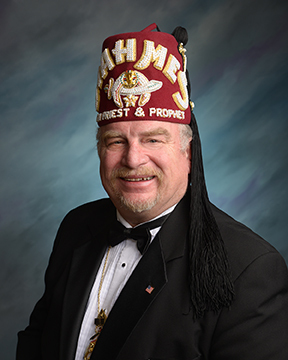 In 2011 he became a Shriner here at Aahmes. He is a member of the Contra Costa Shrine club, Purveyors, and is the Commander of the Legion of Honor.